The project the needed that plywood (and generated a mis-cut sheet thanks to me mis-marking a sheet at Lowe's) has spawned a smaller project: a new "ready storage" wood box to go on the front porch near the door. We've had a small box there all along, but it was not covered (aside from a plastic sheet we tossed over it) and thus the wood would get wet when it rained or snowed. As our main firewood supply these days is energy logs that are pressed sawdust that dissolves when wet, this is not good. 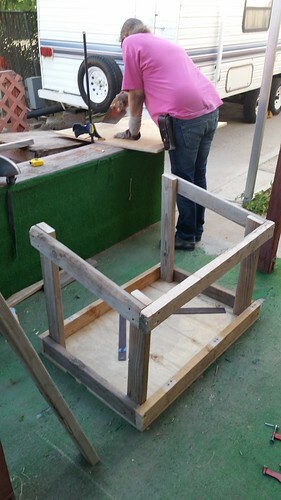 Lisa decided to use the plywood and 2x4s salvaged from some pallets we have laying about to build a new, better box. Lisa is here measuring where to cut the board that will make the rear panel of the box. She's been making liberal use of the table saw we brought from Mehama. It's really nice to be able to make use of the tools we have here, and she's very handy with them. Here's what it looked like when the rear wall of the box was in place. There's still a roof and sides to install. Note that this will have a sloped roof so that what rain and snow we get (not a lot, but also non-zero) will drain off the back of the box. 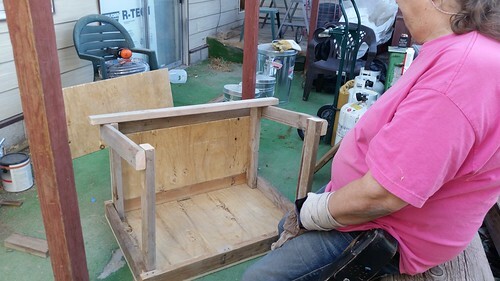 Once Lisa has all of the pieces cut and assembled, she plans to put the small box into the temporarily empty large wood box and paint it there. That way, any paint that drips will simply drip onto the large box, which she's planning on repainting anyway. Like with re-purposing scrap pallets and mis-cut plywood sheets, this is a waste not, want not situation.